They're not a tribute band, they have taken a period and are faithfully reproducing it in the same way that someone would do a theatrical production. Why See The Musical Box? 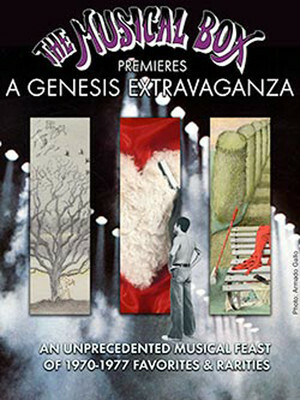 For the first time in their 25 year history, French Candian purveyors of Genesis and world-beloved tribute band The Musical Box are taking on an unprecedented challenge, covering the band's output from 1970 -77 in an epically imagined show that will immerse you in three acts of pure Genesis favorites and rarities! The act have moved frequently between the different eras of Genesis' music, from the Gabriel period, to back to the 1976 Trick of the Tail concerts and everything in between. In 2013/14 the band toured the "Selling England by the Pound' celebrating what would have been Genesis' 40th Anniversary. This year they top it all with this 'fictitious' set that sets out to recreate the early years over three acts, including music from Trick of the Tail, Wind & Wuthering, The Lamb Lies Down on Broadway, Trespass, Nursery Cryme, Foxtrot, Selling England By The Pound and other surprises! Seen The Musical Box? Loved it? Hated it? Help your fellow Los Angeles Theater visitors by leaving the first review! Sound good to you? Share this page on social media and let your friends know about The Musical Box at The Rose. Please note: The term The Rose and/or The Musical Box as well as all associated graphics, logos, and/or other trademarks, tradenames or copyrights are the property of the The Rose and/or The Musical Box and are used herein for factual descriptive purposes only. We are in no way associated with or authorized by the The Rose and/or The Musical Box and neither that entity nor any of its affiliates have licensed or endorsed us to sell tickets, goods and or services in conjunction with their events.